One of the biggest fear of denture-wearers is the appliance falling out their mouths. To aid this, they end up not to talking at all! Of course, there is nothing wrong with a person who chooses to stay quiet but – how long will they need to deprive themselves of social interactions? Until dentures are not stabilized with implants, wearers will continue to live a poor quality of life. Whether a person is wearing dentures or bridges, they can take advantage of dental implants. It is a type of teeth replacement which makes use of a post, abutment, and fake teeth. Dental implants are the only restorative appliance that offers a steady restoration. An implant is inserted surgically in the upper or lower jawbone to make the osseointegration process possible. Once the implant is anchored firmly to the bone, it will then function like natural teeth roots. Are dental implants your choice? Give us at Randolph Family Dental a call! We provide Endosteal Implants, All-on-4 Implants, and Teeth-in-a-Day. Feel free to talk to us if you have any queries about these three. For now, let us give you some reasons why dental implants are worth your investment. Patients will no longer have to purchase denture adhesives as dental implants allow any protheses to remain steady in the mouth. Dental implants are designed for patients to experience long years of smiles. They can even withstand for a lifetime when given the right care. The application of dental bridges may require reductions of the neighboring teeth. Dental implants, on the other hand, allow the other teeth to stay healthy and intact. It is now impossible for dentures to slide when the wearer chew or eat foods. When the prostheses are stabilized with dental implants, patients can enjoy their favorite meals without any inconvenience and pain. If you’re wearing dentures now and you’re not entirely comfortable with them, give us a call! 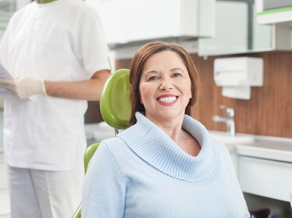 We can discuss our Dental Implants services in Schertz, TX so that your dentures will become more comfortable and useful. At Randolph Family Dental, we make sure that our patients get the best possible solutions for their missing teeth.